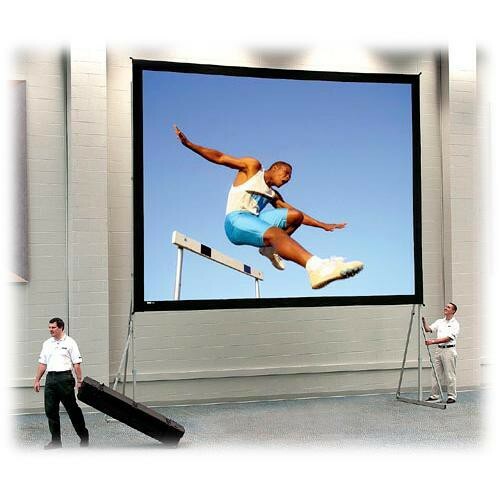 The 13 x 17' Heavy Duty Fast-Fold Deluxe Projection Screen from Dalite is the way to go when you need an easy operating, rugged and completely portable screen system. With the included rolling case, this system gives you the opportunity to take your show on the road with the complete confidence of knowing that you can be up and ready as well as out the door when you want. The frame and legs are made from sturdy 3.25" wide by 1.25" thick aluminum tubing and feature easy release latches for simple, quick set up and tear down of the screen. Box Dimensions (LxWxH) 61.0 x 25.0 x 12.0"